Here is the second set of Les Pleiades, ‘the intelligent collection of Ricercar re-releases’. 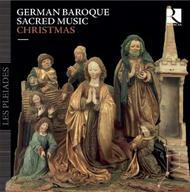 Again devoted to the German Baroque religious repertoire, this appropriate release focuses on the Nativity repertoire, extending from the early 17th century to the generation of Johann Sebastian Bach who is represented here by a few very beautiful Christmas cantatas. Alongside Schütz’s Christmas Oratorio and lovely Yuletide cantatas by Bach’s contemporary Christoph Graupner, we will find in this set the evocation of Nativity scenes, from the Annunciation up to the Presentation in the Temple, as well as the reconstruction of a Lutheran Christmas service. The compositions by Praetorius, Selle, Tunder, Lübeck, Buxtehude, Scheidt, Hammerschmidt, Schütz and Bruhns will tell you the Christmas story with tenderness and joy.